It has been a while since I posted anything Grymn on here, and in truth this project has been pushed to the back of the queue recently. Anyway I was sorting out the mass of figures on my painting desk and decided to get them back together and based in an effort to make some progress. Anyway I spent a chunk of the day basing them. They've all had a small magnet inserted under the base, and the hollow of the base filled with epoxy sculpt. I prefer to do this as I use steel drawers or steel liners for storage and transport, and I like the extra weight and 'heft' of the putty. 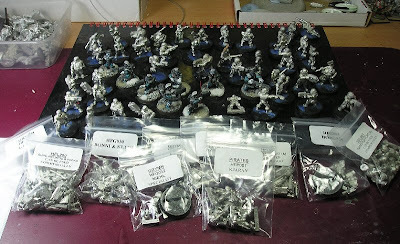 It takes a little while but its one of those boring repetitive jobs that stops you thinking about how many unpainted miniatures you have. It comes in many colours. I was bored with green. 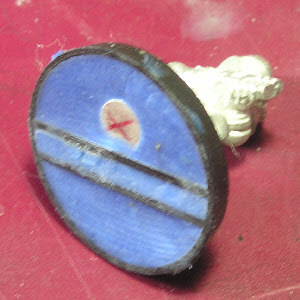 Does the blue epoxy add as much weight as a washer? On larger models, do you still use the epoxy or something else? Thanks! It's good to see a few Grymn on your blog again. I hope that they are a bit more successful than the last lot. shelexie - i've never used washers so i couldn't comment. However to glue a washer in i'd have to cut away the whole slot and the figures tab - so it seems counter productive. Also i've never done it on larger models. Part of the reason the putty is there is to stop the magnet coming off!